I was lucky enough to acquire some really neat vintage cameras a while back. I was waiting for the perfect piece of furniture to come along that I could display them on. I found an old shelf that was on it’s way to the dump and refinished it into the perfect display piece. I am so thrilled to be sharing this project with you this week. I have a serious obsession with photography, old family pictures, and old camera’s. 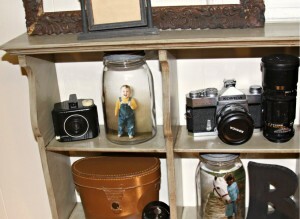 This shelf redo has allowed me the perfect space to display my goodies in an interesting and adorable way. This was the first time that I have ever attempted glazing a piece of furniture and I absolutely adore the finish. I used a regular wall paint that we had at home for the base and added my own glaze made with acrylic craft paint and water. 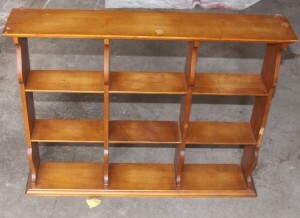 I will give you step by step instructions on how I refinished and glazed this shelf later this week. 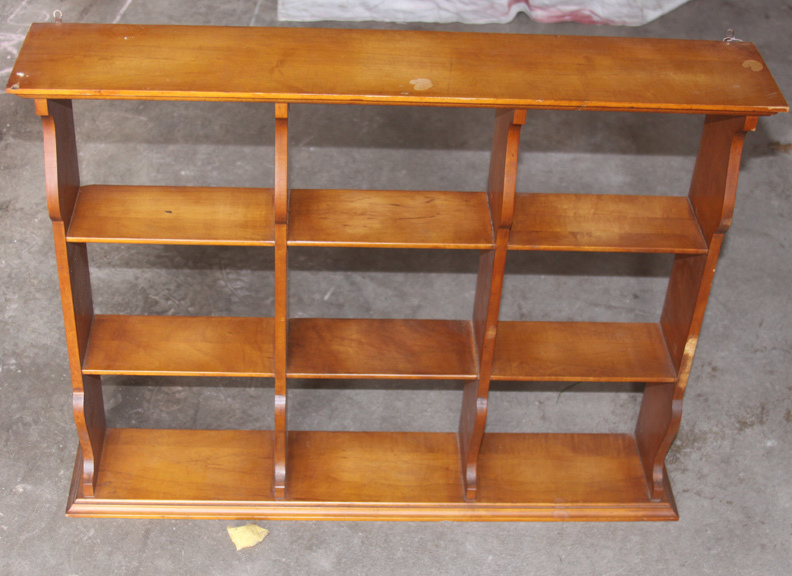 The shelf looks like a completely different piece of furniture after the makeover! 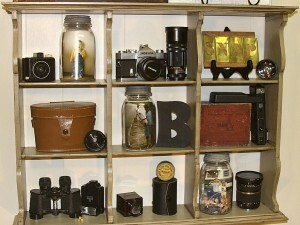 It has the perfect little cubbies to store all of my fun vintage cameras and some old family photos. 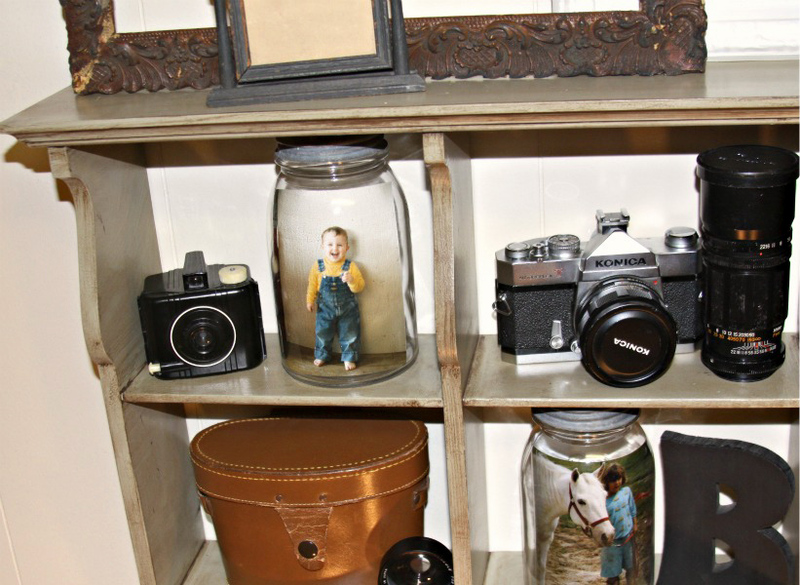 I used three clear mason jars to display pictures of my hubby and I when we were little. They are some of our favorite old photos – the kind that just make you smile and think back to what it was like “back in the day”. My very favorite treasure that I have displayed on my new shelf is this quirky little SNAP sign. I made it using antique metal stencils. The entire set sold for $2.30 back in 1876 according to the packaging. They are so charming and have a great bold font. I am so happy to have them because I think they are just the coolest thing. I used a small antique box top to glue the metal stencils to. 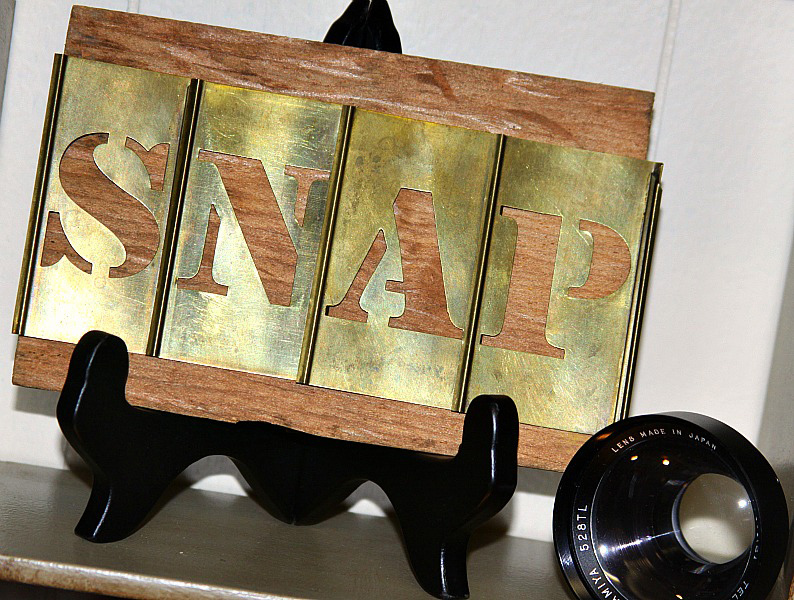 I simply propped it up on a little black dollar store easel to create the perfect little sign for my display shelf. It adds a little humor and interest to my collection. I really enjoy taking pictures and never get too serious about it – so this little sign really made the shelf complete for me. 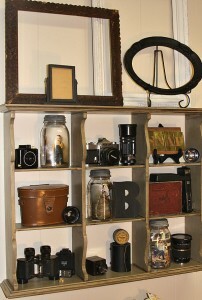 On the top of the shelf I added 2 large antique picture frames. One I laid vertically and the other horizontally. I painted the largest one in a creamy white and left the other natural. I thought is was so cool with it’s chippy corners and worn finish. 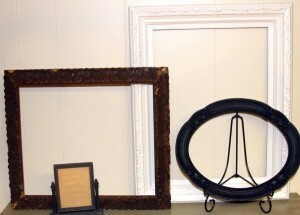 The small black wooden frame is a very interesting handmade antique. 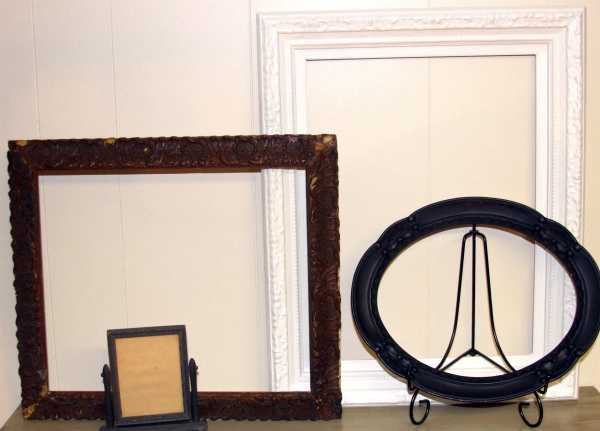 I also painted a plastic oval frame that had an intricate pattern on it black. I set it on a simple and pretty dollar store easel to finish it off. The frames on top add a little height and architecture to the room, which I love. 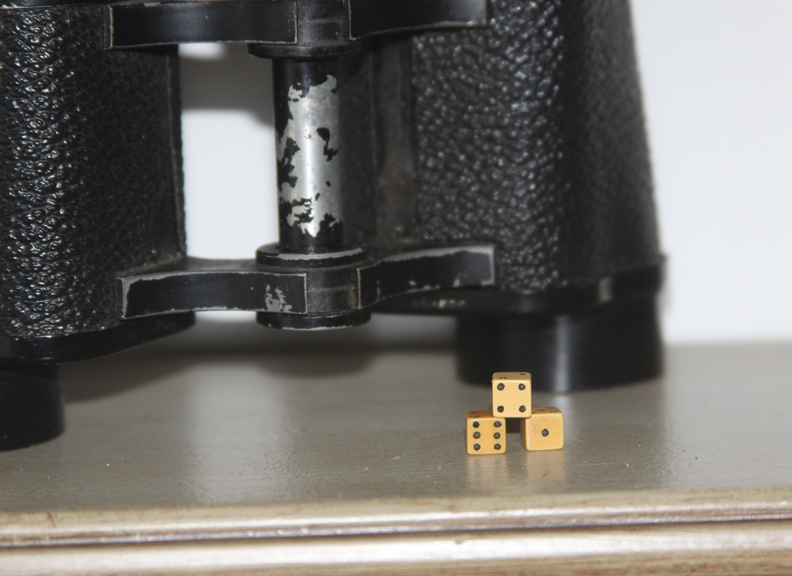 I had an old pair of beat up binoculars to display too, along with these adorable little antique dice. The binocular case is also displayed on the shelf. Some of the other pieces on this shelf include other vintage and antique cameras and lenses. I am happy to have all of these antiques in our home. They have a character and history that is so interesting and exciting. Something that you just can’t buy at a retail store. What I wouldn’t give to know the story behind all of them. 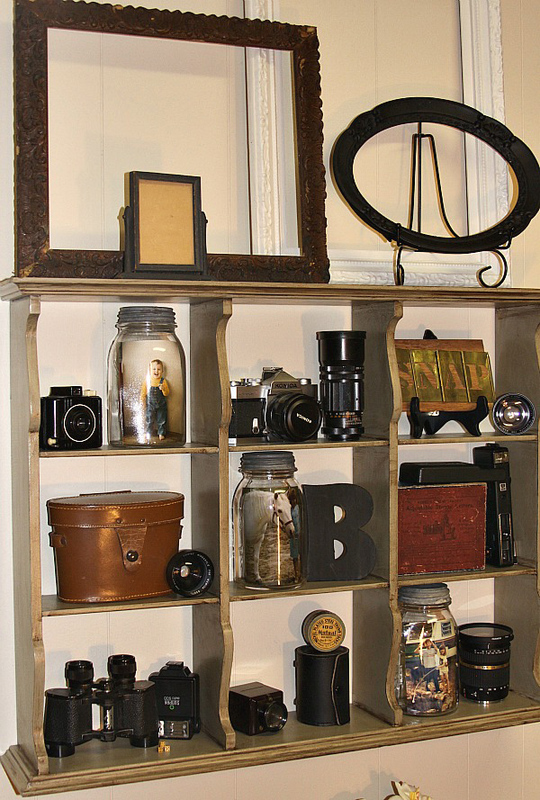 I absolutely love this shelf and all the special little treasures that are in it. 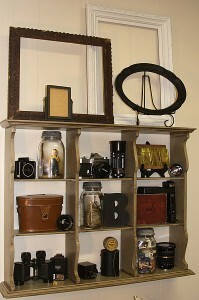 I can’t wait to show you how to make a shelf like this on your own! Thank you Kelly! I do have a craft closet (that is unbelievably unorganized) and a space in the unfinished basement where I get my craft on! 🙂 So Glad you are reading my little blog! The Lazy Apple pie – I do use a smaller dish – usually it is almost overflowing – I use a 1.5 quart dish (the Rachel Ray cookware). This is wonderful! You did such a great job on that shelf — it has great lines and detail and your paint finish really brings it all out! I just purchased some vintage cameras on ebay as I’m creating a ‘vintage travel’ theme in our guest room/study — love the binoculars too! I am amazed to see new life for old cameras….beautiful..love the reuse and recycle concept….